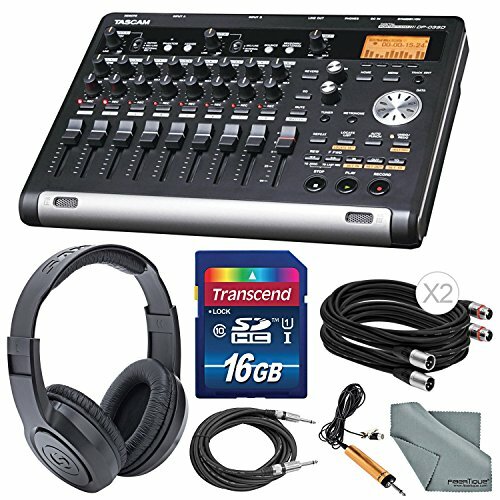 For musicians seeking a Portastudio system which is effective yet affordable, the Tascam DP-03SD Digital Portastudio 8-Track Recorder is a clever option. It is capable of recording 2 channels simultaneously until a total of 8 are filled up. For tight-sounding tracks, a tuner and metronome are built-in, each featuring its own dedicated button, which allows for quick access. Able to record 16-bit/44.1 kHz resolution audio, the DP-03 records directly to SD/SDHC cards and can also export your mix to your computer via USB. TASCAM's DP-03SD is the simplest, best-sounding way to share your music with the world, for all to enjoy and appreciate.